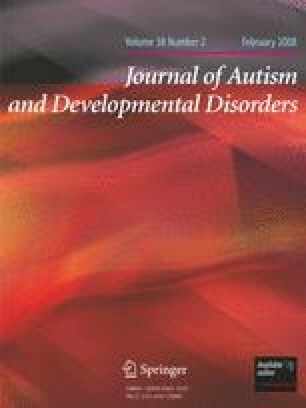 Broader Autism Phenotype in Parents of Autistic Children: Reality or Myth? The finding that relatives of individuals with autism show mild autistic traits is referred to as the broader autism phenotype (BAP). In the current study, 25 parents with a child with high-functioning autism and 25 parents with typically developed children were compared on: (1) the Block Design Test, (2) the Autism-Spectrum Quotient (AQ), and (3) a reaction time task to examine reflexive covert visual orienting to social (eyes) and non-social (arrows) cues. The parent groups were scored similar on the Block Design Test and the AQ. However, fathers with an autistic child demonstrated a different reaction time pattern and responded slower on the social cues than control fathers. These results partly support and further elaborate on the BAP in parents with an autistic child. We would like to thank all parents who participated in this study. Special thanks to those families who helped us recruit parents for the control group. Furthermore, we would like to thank Marijke Zelissen from the IvOO and Martine Strous from Sint Oda for their kind cooperation.